GN4LW stands for Girl is NOT a four letter word. They have a 2nd edition deck out with Dusters and I’m encouraging everyone to take a look. I’m digging it because the graphics are crisp, I’m loving the color scheme, and I 100% agree with the message. People can argue with me all day on whether or not a skateboard deck is a fashion accessory. Truth is your deck is a way to express yourself and let others know what you value and believe in. 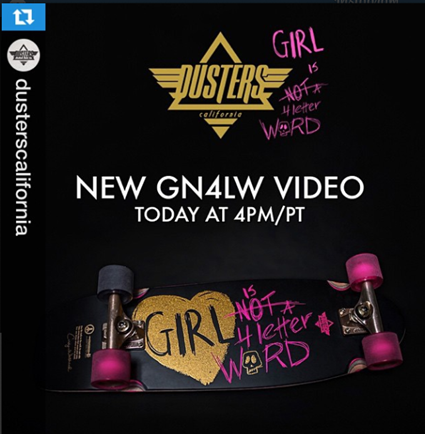 When you ride a GN4LW board you’re letting the world know you believe in equality in skateboarding. Positive messages are always in fashion. So the GN4LW gets my fashion seal of approval in both its black and white formats – maybe because summer is coming I’m loving the white brighter one just a little more.